I’ve got this knit fabric lying around from more than two years, I bought it because it was pretty!! I used a small piece to make this chair cover and then forgot about it! 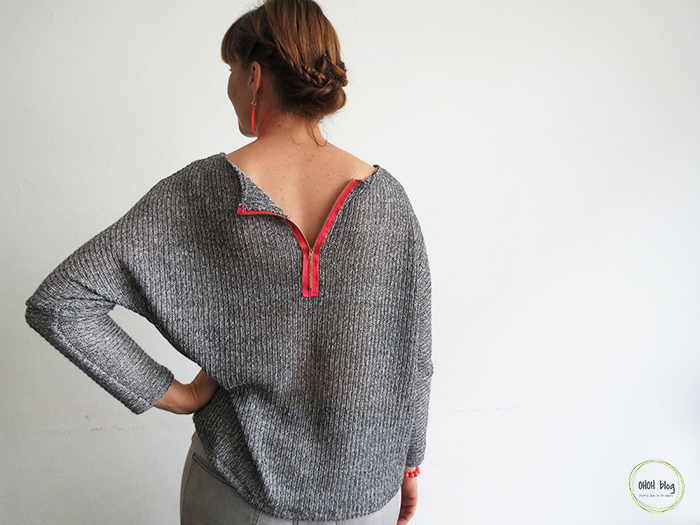 I first tough to make a knit cardigan, like this one, but I change my mind and I decide to make a sweater. 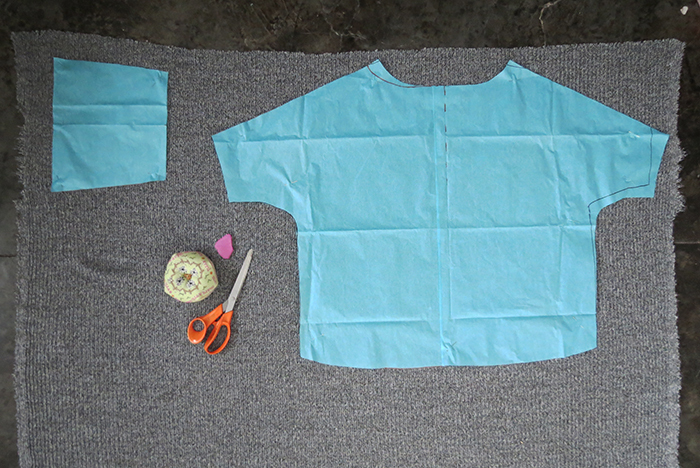 I use a XL t-shirt as template to make the pattern. 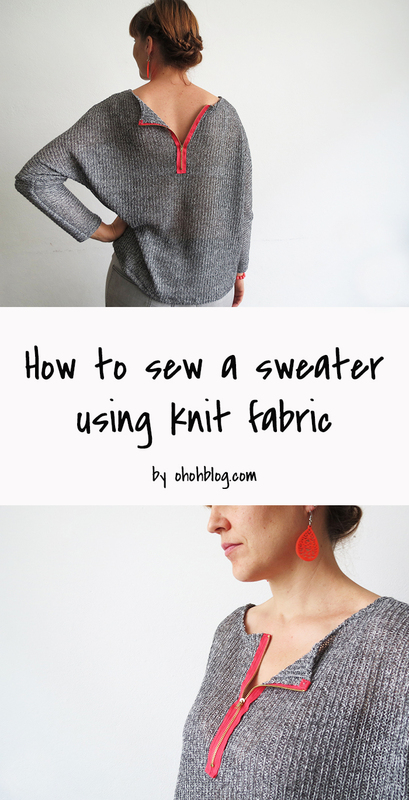 I will explain how to draw the pattern and how to sew the pieces together to make yourself a nice sweater. 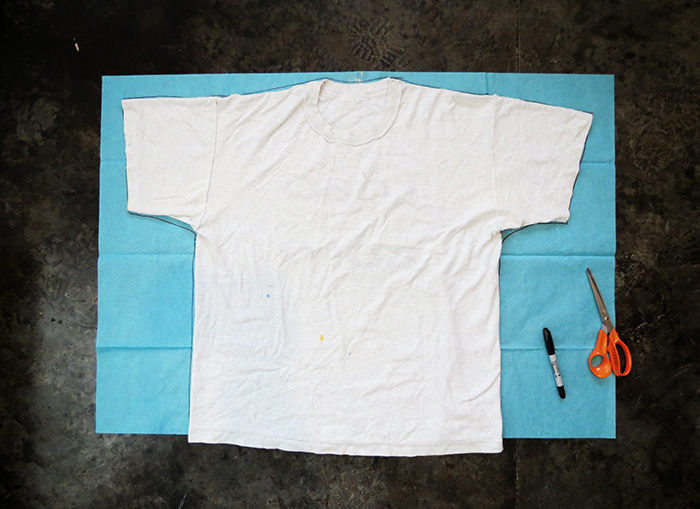 Place a large t-shirt on a sheet of paper. To give you an idea I usually wear L woman size, this is an XL men t-shirt. Report the t-shirt shape on the paper. Draw a more open neckline than the t-shirt one. It has to be 2 inches lower and 5 inches larger ( 2 1/2 inches longer on each side). 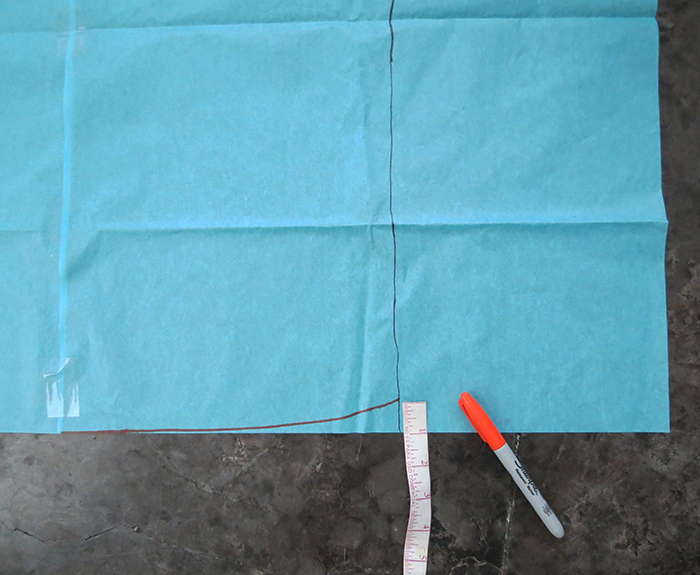 You need to adapt the sleeves width, measure 5 inches from the bottom sleeve edge. 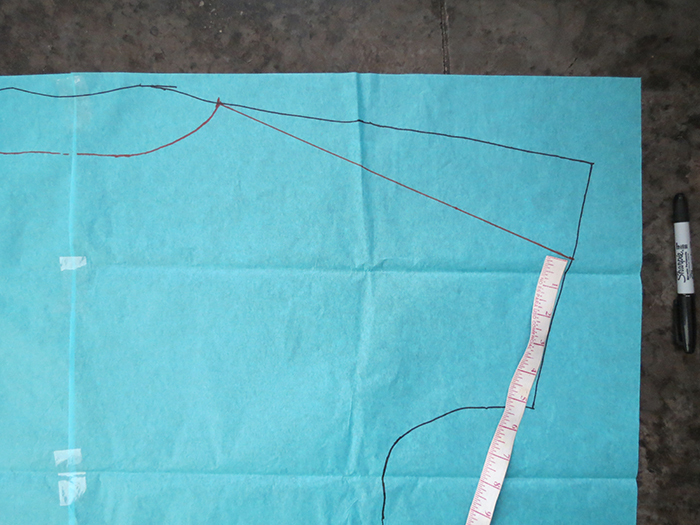 Trace a line to joint it with the extremity of the neckline. 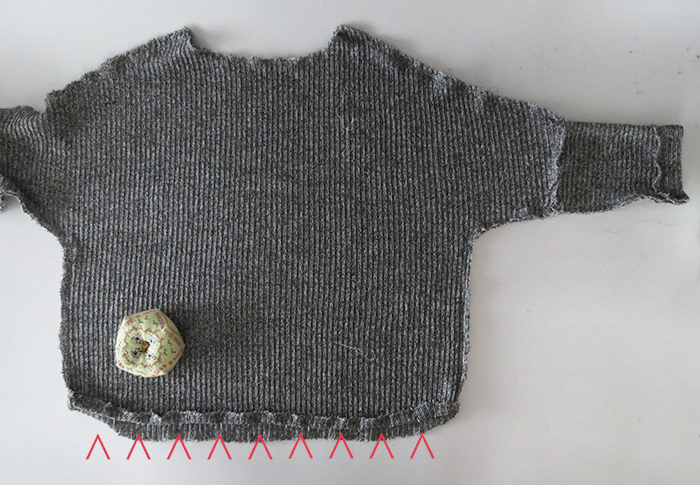 Remember that the measurement I give are to make a L size sweater, so you may have to adapt the dimensions if you wear smaller or larger sizes. The high of my sweater (aka the measure between the neckline and the bottom) is 24 inches. 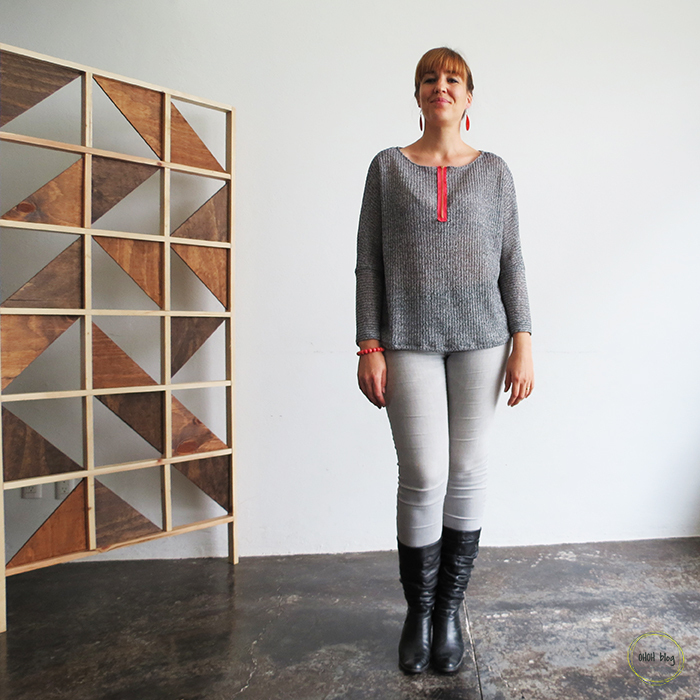 You can choose to make the sweater longer or shorter. Just take the measure, starting from your shoulder to your belly / hips / thigh. Modify a little the bottom line, draw a slight curve instead of a straight line. 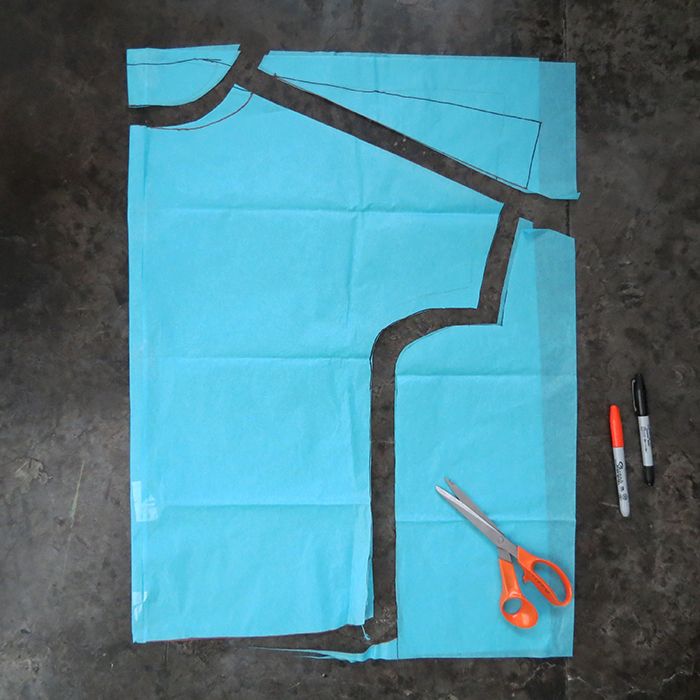 Fold your drawing in the middle and cut it, it’s the best way to have a perfectly symmetrical pattern. 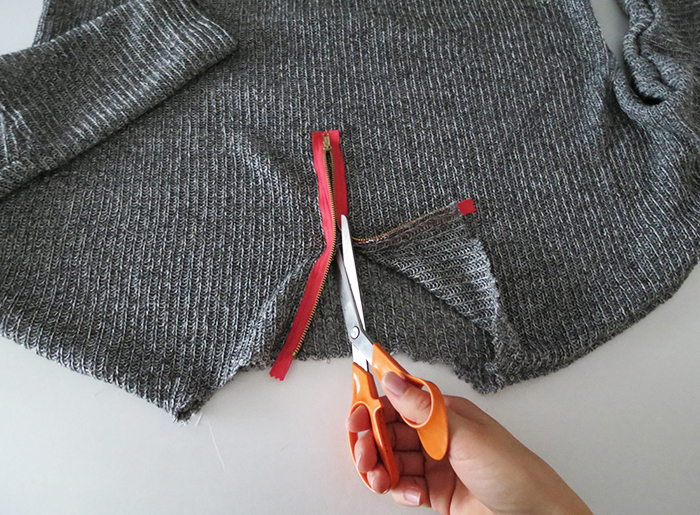 Cut a rectangle of 10 inches by 8 1/2 inches to make the second part of the sleeves. Ford the rectangle in the middle and draw a triangle of 1 in. high on one side (not on the fold). And cut, this will make the end of the sleeve smaller. Report each shape twice on the fabric. 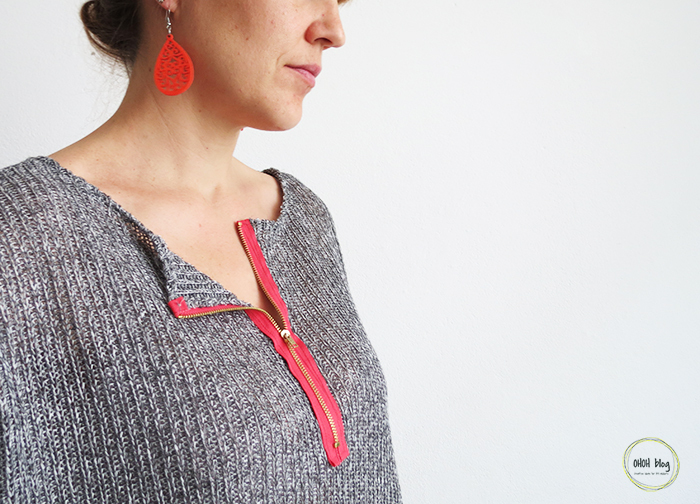 I couldn’t draw on the knit, so I pin the pattern and cut it out. Don’t forget to leave an 1/2 in. allowance for the seams. Once the 4 pieces are cut, serger all the edges! If, like me, you don’t have a serger machine, just make zigzag points. This will prevent the fabric to fray. Place the 2 sweater pieces on top of each other, wrong sides out. 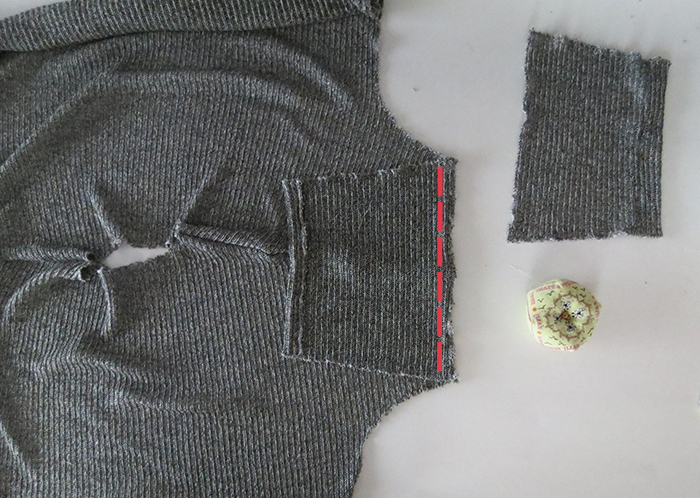 Pin and sew the shoulder part of the sleeves using zigzag points. 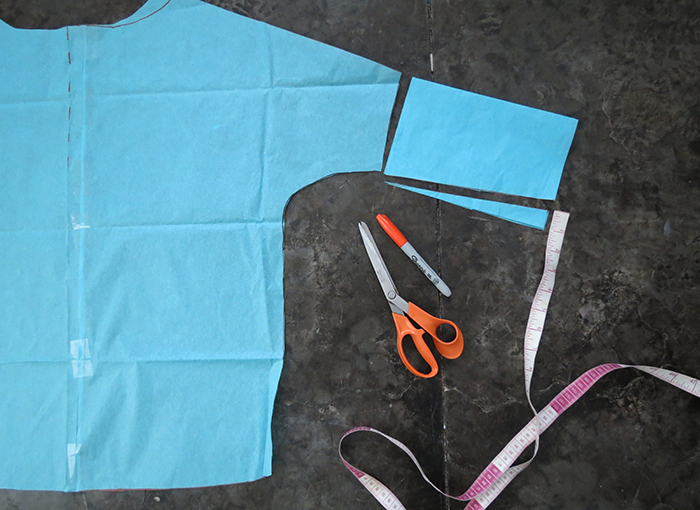 Take the sleeves pieces, make a fold on the smaller side and sew it. Open the sweater, right side up, and put a sleeve piece on it, wrong side up. 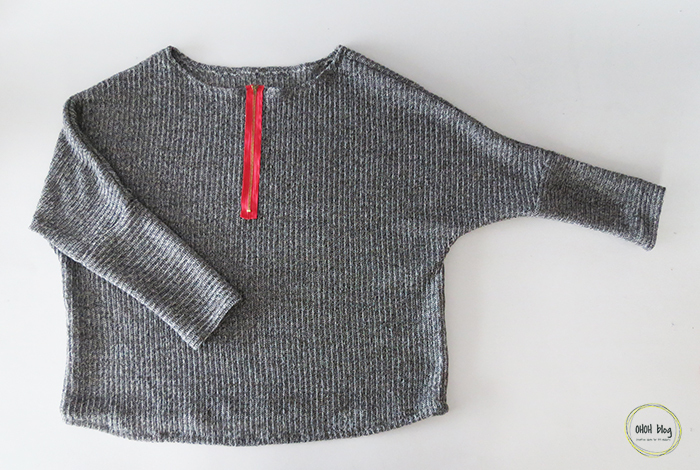 Pin and sew the sleeve with the sweater. Repeat the same on the other side for the second sleeve. Put your sweater flat again, wrong side out. Pin the edges and sew (zigzag point) the low part of the sleeves and the sides together. 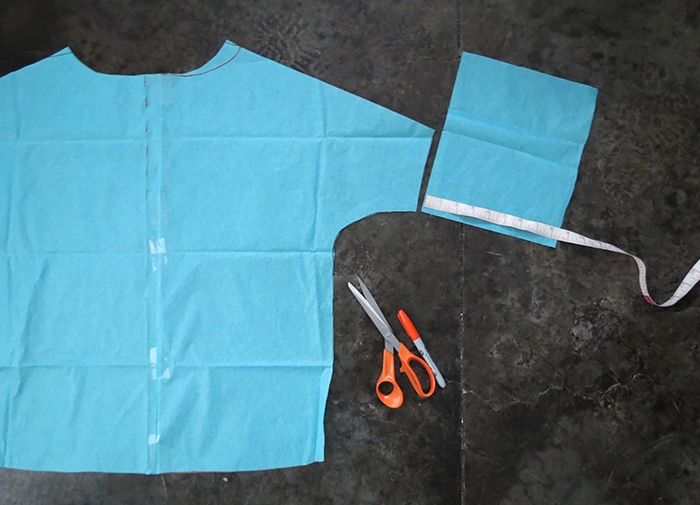 Once both sides are sew, make a fold all along the bottom, pin and sew. 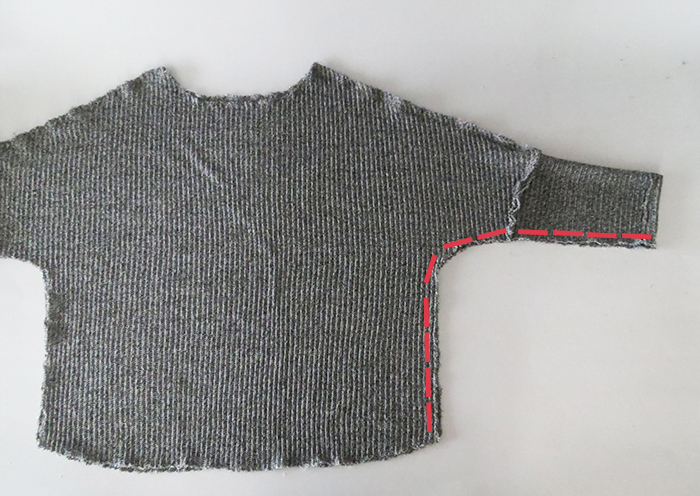 Almost done, turn your sweater right side out and place the zipper in the center of one side. 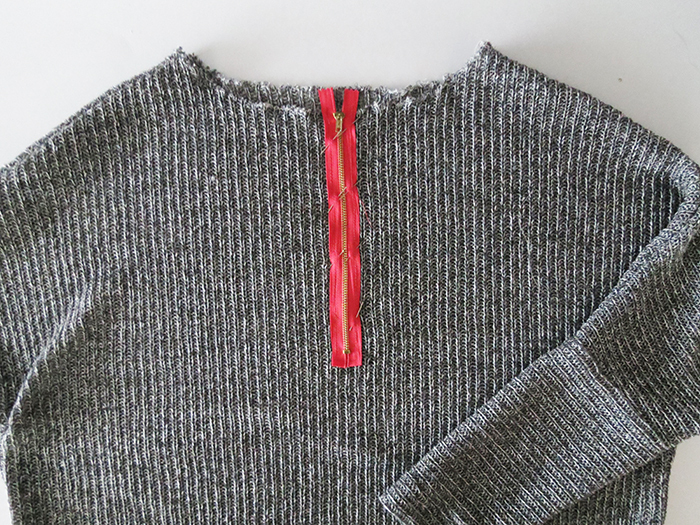 Pin it (fold the zipper end under it) and sew it on the sweater with a matching color thread. 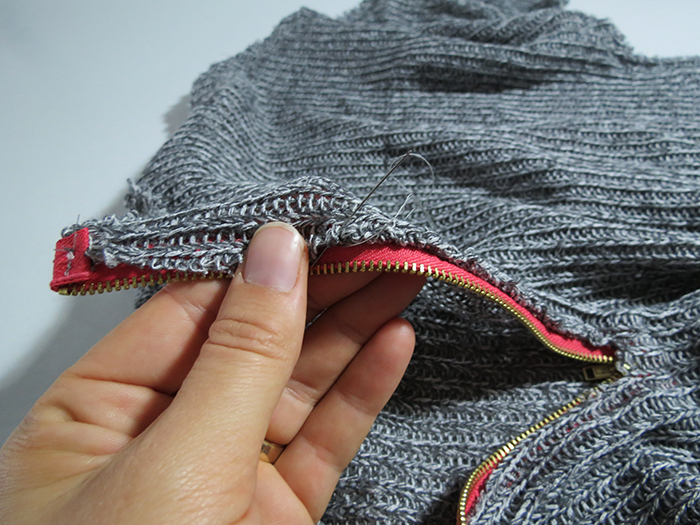 You need to sew the zipper on only one side of the sweater, so be careful not to sew both layers. 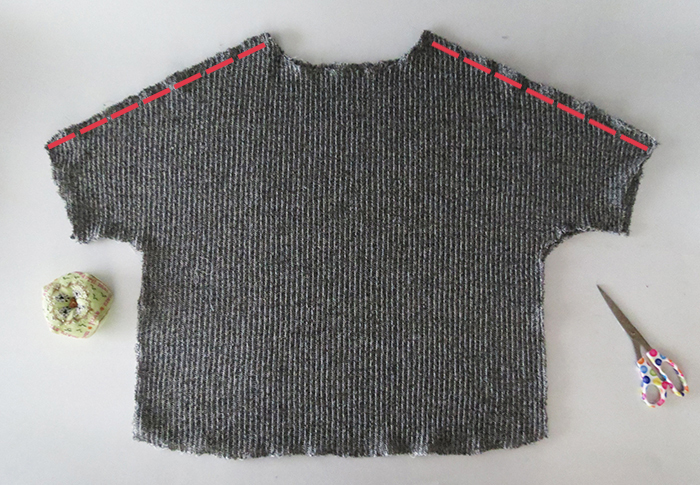 Once sewn, open the zipper and cut the knit fabric. 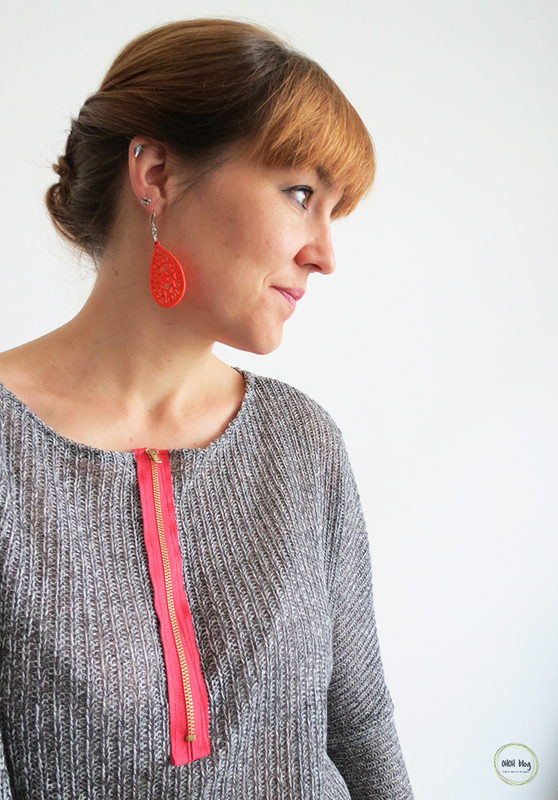 Use pin to make a fold, trough the inside, all along the neckline and sew. The last finishing touch all long the zipper, roll the fabric on itself and make small hand stitches to hold it. And done! 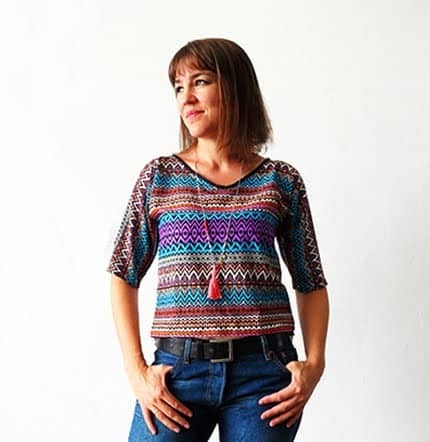 Wear and enjoy your new sweater! or open! It’s kind of fun. While I was writing the tutorial I realize that drawing the pattern wasn’t as easy to explain as I thought. So, would you be interested if I make a printable pattern? Any suggestion about that? Great idea. It looks comfy and also very trendy. Thanks for sharing the idea. Thanks Sonja, I'm glad you like it!